This entry was posted in Early Learning With Music, Family Fun, First Instruments, Homeschool Musical Fun, Simple Instruments, Special Needs/Kids of All Abilities and tagged best instruments, best instruments kids, Children, childrens music., Daria, Easiest Instruments For Children, easy instruments, Easy Instruments kids, family fun, Kazoo, kazoos kids, kids and kazoos, kids music, music for toddlers, National Kazoo Day, playing kazoos, playing music for children, playing music for kids, world music with daria, young children and music. Bookmark the permalink. One Response to Can You Kazoo? Love the kazoo! The idea that it is a great instrument to build musical confidence is brilliantly true! Ballarat used to have a wonderful `Kazoo Orchestra’ (maybe they could re-form or you could form one in your home town). When I covered it back in the day, I used to play the solo from Bowie’s `Heroes’ (http://www.youtube.com/watch?v=Tgcc5V9Hu3g) on the Kazoo, and of course the instrument was also used in the place of the bagpipes for the Meanies’ famous cover of the AC/DC classic `It’s a Long Way to the Top’ (http://www.youtube.com/watch?v=1zIo01J6pmM). 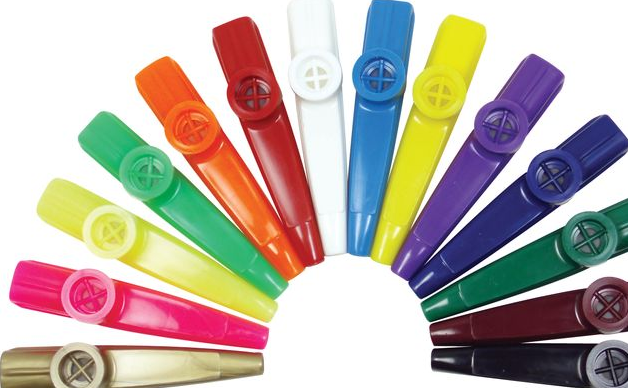 So, yes, folks: the kazoo; credible, useful, awesome.